Chemistry lies at the heart of modern science. Advances in fields such as molecular biology, environmental science, materials science and medicinal chemistry are built upon an understanding of chemistry. Chemistry courses provide a sound background in chemical principles while open-ended investigative laboratories teach students to become chemists. These labs present opportunities for students to design their own experiments and experience the excitement of discovery. 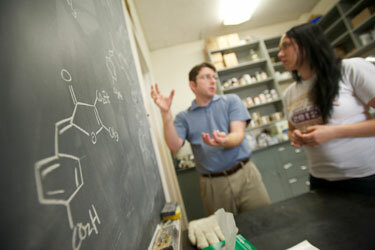 What is distinctive about studying chemistry at Sweet Briar? Beginning in introductory courses, students gain experience with sophisticated, research-quality equipment. Students learn to present their results in both written and oral form. The culmination of the chemistry major is the completion of a semester-long independent project. Our small class sizes ensure that faculty are more than teachers; they are mentors who are committed to your success at Sweet Briar and beyond. Three to four students per section is typical for intermediate and advanced courses. The maximum for intermediate level is eight students; each section in advanced labs is typically two to five students. For students motivated to pursue graduate study after Sweet Briar, the Honors Program provides an opportunity to earn an Honors Degree through advanced core classes and a 3-semester independent research study with a faculty mentor. The research culminates in a written thesis and an oral defense in front of a thesis committee. Students not in the Honors Program are also encouraged to conduct independent research. though not necessarily defend a thesis, with a faculty mentor. The program has a strong record of obtaining funding from major federal grant sources such as the National Institutes of Health (NIH) and the National Science Foundation (NSF), as well as regional sources, including the Jeffress Memorial Trust, the Gwathmey Foundation, the State Council of Higher Education for Virginia and the Commonwealth Health Sciences Research Board. Faculty members stay active in their disciplines by participating in professional organizations and by attending a variety of professional meetings, including in research and education. Sweet Briar chemistry alumnae go on to the top graduate programs in the country, including CalTech, Princeton, Harvard, Purdue, Penn State, Ohio State, Duke, UNC, Vanderbilt, University of California Riverside, Florida State and UVa. These students can pursue advanced degrees in chemistry, biology, pre-medical or forensic-environmental science, physics or engineering. High numbers of chemistry alumnae are accepted to programs in medical, dental, pharmacy and allied health. Students interested in business, manufacturing or government have been accepted immediately upon graduation into positions at Anheuser Busch, the FBI crime lab, D.C. City Metro crime lab, Fleet Pharmaceuticals and more.